One of four famous 18-hole layouts operated by the Pebble Beach Company, Spyglass Hill Golf Course has been on the rota for the PGA Tour’s AT & T Pebble Beach National Pro-Am since 1967, the year after it was first unveiled. Designed by Robert Trent Jones Snr, it’s well known as a tough track and at least one commentator has termed it one of the best courses to have never staged a major. It was originally called Pebble Beach Pines Golf Club but was renamed very soon after it opened by Samuel Morse, founder of the Pebble Beach Company, and he labelled all the holes on the course after characters and places from the 1883 novel Treasure Island by Robert Louis Stevenson, who spent time in the Monterey area before the book was first published. Occupying a fabulous tract of coastal land between Cypress Point and Monterey Peninsula Country Club, Spyglass Hill is regarded by many as a more demanding test than its more celebrated near neighbours, with it bearing more than a passing resemblance to another couple of iconic world-class American courses, as intimated by its esteemed designer. Feature holes include the 370-yard 4th (“Blind Pew”), where the 55-yard long green is surrounded by ice plant vegetation, the 399-yard uphill 8th (“Signal Hill”), with a reverse cambered fairway, and both the two par threes on the back nine; the 178-yard 12th (“Skeleton Island”) which plays downhill to a pond-protected green and the 130-yard 15th (“Jim Hawkins”) with its putting surface bounded by water, sand and a falloff to the left. It’s a good course, but not great. The first five holes are unique, majestic, and supremely enjoyable. The next thirteen are somehow both extremely challenging and extremely unmemorable. It’s 1960s blah target golf at its finest, and on top of that seemingly every long hole is narrow with an uphill approach. Perhaps that’s enjoyable architecture to some people, but not to me. The first five holes and the set of par threes on the course prevent it from being a complete miserable slog. I’d be very interested to see how Spyglass would be received if the course routing was completely reversed – as in the golfer from green to tee on every hole from 18 to 1, with modern green complexes designed by Hanse or Doak or the like. I’d wager a fair bit of money that it would be a better course. Certainly the finishing stretch climbing to the clubhouse would be classic. Among the courses on the Peninsula that I’ve played, I would rank Spyglass as my least favorite, and certainly for the money I would play Spanish Bay or Pacific Grove which are easier and either the same or more scenic. It is purported that Robert Louis Stevenson, of “Treasure Island” fame, spent time in this area to cultivate ideas for his novels. This Robert Trent Jones course opened in 1966. The first hole, a downhill par five dogleg left is aptly named Treasure Island; make sure you stay right or you will get blocked out. The third hole is called Black Spot, a short downhill par three. It can be deceiving; be wary of the wind and trust me, being long is not good. The fourth hole, Blind Pew, is really cool. It is not a long par four, a dogleg left, but the placement of the tee shot is critical. It is one of the narrowest greens that I have seen with multiple tiers set at a redan. The brilliance of the hole is if the pin is left, the tee shot should be right and if the pin is right, the tee shot should be left. After the fifth hole my caddy asked what I thought of the course so far. I responded that I liked it. He said, “Now comes the tough part.” He was right; what a difference between the first five holes, which are seaside and the next 13, which are situated in the Del Monte forest. The eighth hole is a killer par four. It is less than 400 yards but uphill. I hit a good drive and a good five wood and was still twenty yards short. The ninth isn’t quite as bad, but you do not want to be above the hole. My favorite hole on the back nine was the 17th, Ben Gunn. It is a relatively short par 4. The landing area for your tee shot is blind as is the uphill approach shot. I cannot tell a lie, it was my favorite hole because it was the only one I birdied. It may also be, because the 16th hole is a real killer, as well. In my opinion, Spyglass Hill is a much tougher course than Pebble Beach. It is definitely a target rich barkie environment. The wind is not as much of a factor as Pebble, but the fairways are very tight and you can find yourself blocked out if you are on the wrong side of the fairway. It has consistently been rated as one of the toughest courses in the world. The 6th, 8th and 16th typically rank amongst the toughest holes on the PGA tour just about every year. I have had the opportunity to play Spyglass Hill on a number of occasions over the years and my earliest opinion still holds. I shake my head at a routing that offered the best visual and strategic holes at the beginning -- rather than at the end. As others have opined -- I concur the first five holes get the golfer's blood flowing and you feel the wind and see the Pacific in the nearby distance. There's little question Spyglass provides a demanding test as you make your way away from the coastal area into the interior of the Del Monte Forest. The uphill nature of a number of the holes later in the round put a maximum premium on being able to carry the ball sufficient distance in order to gain a better angle for one's approach. Spyglass is the epitome of Robert Trent Jones, Sr. core design philosophy of "tough par / easy bogey" mantra. The course showcases his style -- the massive putting greens with flanking large bunkers. The primary claim too fame is how demanding the course can play because of the terrain that follows for the final 2/3's of the round. What would have been interesting to have seen is if the routing was reversed so that the ending climax comes from being nearer to the coastline as the first five holes show. In so many ways -- once you have played the opening salvo of holes you are stoked for more -- and then you realize quickly on that the best of what you have played is now over. I am a big time fan of the par-4 4th hole. One of the most difficult holes to design is a par-4 that is more than 350 but less than 400 yards. The 4th is brilliantly done -- using the terrain so well and the approach shot is one of the finest you play among all the courses in the Pebble Beach area. I really like how the menacing ice plant becomes more and more of an issue when the pin placement is in the deep rear area of the green. In many ways Spyglass gets a clear boost in being in the same area as such heavyweights as Pebble Beach and Cypress Point. It's too bad on "what might have been" if a better overall routing was carried forward at the inception. Spyglass is clearly rigorous but the bulk of the architecture after the first few holes simply becomes a recipe for demanding golf -- not compelling architecture of the first order. Spyglass is really the tale of two courses. The intoxicating holes along the bay (1-5) are dramatic, wide open and exposed to the elements. The inland holes (6-18) are difficult, tree-lined and play on terrain that slopes uphill. The opening five holes at Spyglass are dramatic. I would be hard pressed to think of a golf course that has a better opening stretch of holes than Spyglass. The first hole, named Treasure Island, is a downhill sweeping par five that offers tantalizing glimpses of Monterey Bay through the trees as you stand on the tee. As you proceed down the hill, the hole sweeps to the left and the bay provides a wondrous backdrop for the green. The first five holes are truly invigorating, and if you play Spyglass, enjoy them, because the easy part of the course is now behind you. After the fifth hole, the course changes dramatically. The fifth and remaining holes play away from the bay, and there are no more views of the water. The rest of the course frankly feels more like Pinehurst than it does Pebble Beach. It winds its way through pine and cedar trees on the rolling terrain, leading to a difficult round of golf. When the AT&T Pebble Beach golf tournament is held each year it is played over three courses - Pebble Beach, Spyglass and nearby Poppy Hills. The pros complain about Spyglass generally, because it is such a stern test of golf. Holes six, eight and sixteen rank among the toughest on the tour each year. My first visit here was in 2011 where I really liked the course. My second visit here was last week and all I need to add is that this course is one of my favourite around the world. I am a deep fan of german rock band Running Wild and they wrote the TREASURE ISLAND song as a tribute to Stevenson's nobel. Well, this course is also a tribute to that novel with all holes having a name related to the novel being 10th (Captain Flint) the name I like more. We played it while I was leading a 44 argentine golfers group to Pebble on a stunning afternoon and I really enjoyed it having played really well the last 10 holes. As I said and many do so this course can be divided into 2, the first 5 holes playing similar to Spanish Bay with views of Cypress Point and 6-18 into the forest where there is a feeling of Augusta all over it. It is not casualty that it's designer (RTJ Sr) was the first one to make some changes to Augusta (redesigning par 3 16th). It is a great challenge, not even 1 weak hole and mantained amaizingly well. Now having played it twice there are some holes which stand over the top: uphill par 4 8th is a masterpiece, second shot plays similar to Augusta 18th. Then par 5 14th is one of the best I have played and par 4 16th (stroke index 2) is the nicest and most challenging of the course. It is not only a must play, but also I can say that if it plays a match against Pebble the winner is not so clear and could even be Spyglass. 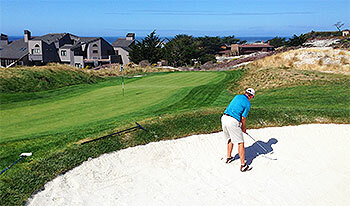 Spyglass Hill’s first few holes are exciting and interesting as you play along the sand dunes of the Pacific Ocean. With barking seals in the background, the course seems quite lovely. However, after the fourth hole, it moves up into the woods, away from the ocean, and it becomes just plain difficult. The fairways and greens of the back nine are home to many deer. Some have so little fear of humans that you have to shoo them off the tee boxes. I was surprised to find this course on the Top 100, but Spyglass Hill has stayed on the list and remains in the Pebble Beach pro-am rotation. Larry Berle. Strange routing. Three of the four par 3s play severely downhill, while many of the par 4s play significantly uphill. To me, it seemed like RTJ did a pretty weak job of using a very interesting piece of property.Enjoyed the course, but not among my very favourites. For some reason known only to the golf gods my driver which goes 275+ everywhere else in the world, including pebble beach, goes 250 max at spyglass. All of the driving holes are uphill and into the wind. This is the toughest test of "fair" golf on the planet. And my favorite course in the world. I would love the 7:55 tee time 7 days a week.